Take a careful look at the label - soon it will be history! Prehistory is that the domaine Rolly in 1947 was divided between two sons. After another generation, there were the "cousins" Rolli-Edel and Rolly-Gassmann. But due to lack of succession, Rolli-Edel is about to sublimate, the residual stock is sold out and the vineyards united again with those of Rolly-Gassmann. Silberberg, is one of many brilliant Rorschwihr Lieux-dits. 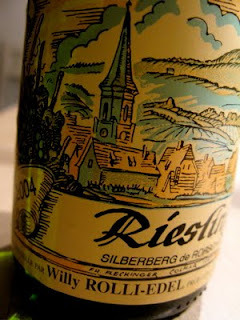 Others are Kappelweg, Kugelberg, Muenchberg, Pflaenzerreben, and Stegreben (often far more personal than Grand Cru Gloeckelberg in the neighbouring village Rodern).